Born on the track, built for the road! 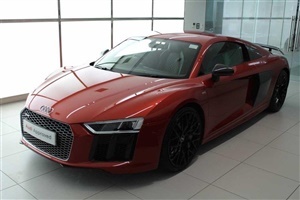 We have this incredible Audi R8 Coupe V10 plus 5.2 FSI quattro S tronic in Aventurine Orange paint finish. Spec includes, Sport Plus Pack, Reverse camera, Fine nappa Leather, Bang and Olufsen, Cruise control, 20" 10-spk Y gloss black alloys and more features. Why buy Audi Approved?, When you buy an Audi Approved Used vehicle you have the reassurance that all cars have to meet our meticulous standards. All Approved Used Audi vehicles undergo a comprehensive series of stringent tests and inspections., , 145 Point check to pass, These include; separate mechanical, interior and exterior checks, full road-test and a detailed written report., , Service History, We provide you with a service history certificate at the time of vehicle handover, detailing all routine servicing work completed by the Authorized Audi Centre., , MOT Protection, Protects you from potential costs incurred from a range of repairs up to the value of £750, if your Approved Used Audi fails MOT. For full details see our T&C's, , Reconditioning with Audi Original parts, Should the multi-point check highlight any irregularities, we will undertake rectification work using Audi Original parts., , 30 day exchange Plan, In the unlikely event of a demonstrable fault occurring within 30 days/1,000 miles, we will offer an exchange. This does not affect your statutory rights., , Key Insurance, If your keys are lost/broken or there is a fault with the locks, we'll cover the cost of replacements and fitting at your local Audi Centre., , History & Mileage Checks, The Audi you buy will have a clean, transparent record and independently checked mileage., , Warranty & Roadside Assistance, 12 month Audi Warranty, Audi Roadside Assistance, and consequential expense cover (car hire and accommodation). , Next MOT due 31/08/2021, Excellent bodywork, Interior - Excellent Condition, Tyre condition Excellent, ORANGE, £101,990.